Hi! Last September I had an article published in Cloth Paper Scissors magazine. I had developed a transfer technique using scanned tin type photos printed onto a transparency and then transferring that image onto copper or metal. Now that I've decided not to sell collage sheets on my website (because I'm a crappy email-er and snail mailer), I've been designing new and redesigning my old collage sheets that are now being offered for sale by Alpha Stamps! I've given Alpha Stamps permission to scan and post my article on their website and have created a full page of tin type images for sale on the site. 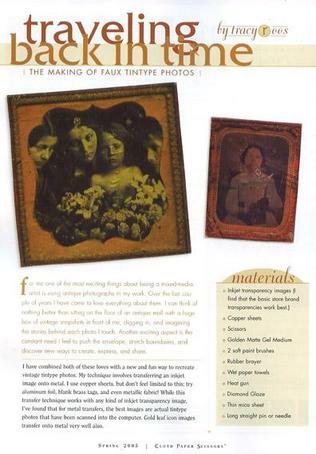 I am looking for a copy of Cloth, Paper, and Scissors - Sept. 2007 with the article on making faux tintypes. Or just a copy of the article. I went on Alpha Stamps and they have all but the end of the article. When I clicked on it, I could not copy it. That was my favorite article of all and the only issue of that magazine I actually saved. I'll always think that you are a genius.